An initial dosage of 5ml per day before breakfast is recommended for a period of 5 days, followed by an ongoing dosage of 10ml per day. A dosage of 20-30ml per day may be useful where beneficial results are evident or desired during illness. The probiotic can be taken with juice. The best times are first thing in the morning and last at night. This probiotic is alive and should be kept at room temperature in a cool, shady place and NOT stored in a refrigerator. The bottle is best kept air tight and where necessary decanter the probiotic into smaller bottles to minimise the air gap above the liquid. And like any life-based organisms (including you! ), keep it away from electromagnetic fields. I have some really good news that I think most of you will find very interesting. For about a week now, I've been ingesting large amounts of a probiotic brew called Effective Microorganisms (EM). I have Crohn's disease. Results have been rather astonishing! Initially, I went through a rough couple of days with increased D and gas. I reckon this was because of a major shift in intestinal flora balance. Then, things calmed down to a level I've never experienced before. I feel very robust in my abdomen and I've had LOTS of energy and very good BMs (Bowel Movements)!" Here is more info on the PNSB bacteria and other strains you was asking about. Ormus Minerals Probiotics is a liquid blend of beneficial and efficient microorganisms, which include enhanced levels of phototrophic, purple non-sulfur bacteria (PNSB). These microorganisms, when introduce in to any living system, promote the growth of naturally occurring beneficial bacteria to achieve a healthy microbial balance. The purple photosynthetic microbes present in Ormus Minerals Probiotics at enhanced levels have powerful detoxifying, antioxidative and anti- entropic properties. These properties have the ability to reduce levels of certain toxins, toxic gases, odors and can help to re-establish a wide range of effective and beneficial microorganisms* in an otherwise polluted or unbalanced environment. In general, effective microorganisms such as those from the Phototrophic group can utilize both inorganic and organic materials as hydrogen donors and are capable of growing in light and/or dark conditions of which the microbes will require different growth factors. Basic hydrogen evolution during breakdown of fatty acid is as follows. Phototrophic bacteria are known to play an important role in carbon assimilation and nitrogen fixation. They can be found in extreme condition where temperature ranges from 0-90°C or at the depth of 2,000m. They can convert sunlight to cellular energy by absorbing atmospheric carbon dioxide or breakdown inorganic as well as organic carbon and converting it to biomass. This microbe can also degrade and recycle a variety of aromatic compounds that comprise lignin, the main constituent of wood and the second most abundant polymer on earth. 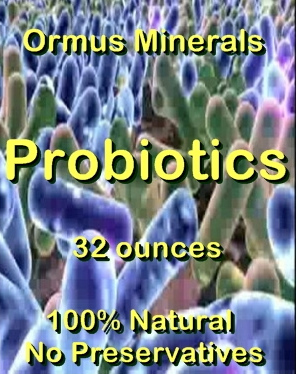 Rhodopseudomonas palustris contained in Ormus Minerals Probiotics, for example, is acknowledged by microbiologists to be one of the most metabolically versatile bacteria ever described. Not only can it convert carbon molecules into cell material but nitrogen gas into ammonia, and it can produce hydrogen gas. It grows both in the absence and presence of oxygen. In the absence of oxygen, it prefers to generate all its energy from light by photosynthesis. R. palustris also can increase biomass by degrading organic compounds including such toxic compounds as 3chlorobenzoateto cellular building blocks. When oxygen is present, R. palustris generates energy by degrading a variety of carbon containing compounds (including sugars, lignin monomers, polymers and methanol) and by carrying out respiration. * Streptococcus spp. are catalogued as Enterococcus spp. on the list of organisms approved by the Association of American Feed Control Officials (AAFCO).